On military ranges, where most of our fullbore shoots take place, targets are chosen according to the distance and course of fire. The most commonly used target is known as a Figure 11. This is 44 inches high by 17 inches wide and depicts a charging infantry soldier. 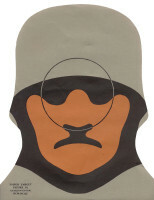 This target is normally engaged at distances of 200 yards or more. The next size down is the Figure 12. This "head and shoulders" target measures 21.5 inches high by 17 inches wide and is normally used at 100 yards. Then there is the Figure 12c, which is a smaller version of the Figure 12, measuring 16 inches high by 12 inches wide. This target is normally mounted on a pole and used for "snap" shooting where the target is raised for short periods at random intervals. The smallest target in common use is the Figure 14. This measures 11 inches high by 7 inches wide and is also used for snap shooting. All the targets have scoring rings. Their use varies, but typically shots within one of the rings will count as 5 points, and anywhere else on the target as 4 points. When shooting at Bisley, humanoid targets are not permitted. 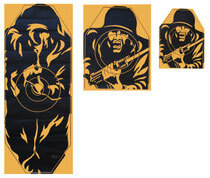 The NRA provides a range of Disruptive Pattern (DP) targets for Civilian Service Rifle competitions. DP11 is equivalent to Figure 11, DP12 to Figure 12, etc. Here's a picture of three targets showing the relative sizes. From left to right they are DP11, Figure 12 and Figure 12c. This is the DP14, which is used at Bisley for the popular McQueen Practical Snap shoot, where the target appears randomly for 3 second exposures in the windows of a castle. The target is printed A4 size and the rings are scored 6, 5, 4 and 3 points.